Hamilton Bulls got their season back on track after last week’s one point loss by picking up the win at Dundee for the first time ever. 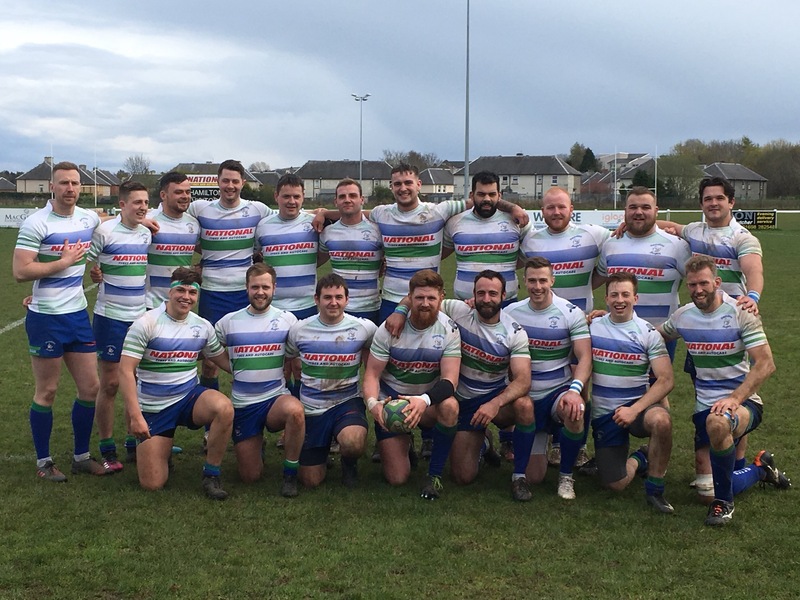 However the score of 40 - 27 gave their supporters a nervous final quarter as Dundee threw everything at the Hamilton lads who had nosed in front early in the second half, with Hugo Crush bagging a hat trick of tries. Coach, David Gemmell, though delighted with the result and the determination of his team said “We know we are still a work in progress. It is frustrating to give teams a start every week, so that the lads have to dig deep to turn matches around. They did it today, by matching them up front and showing our attacking flair”. Dundee started brightly and this soon bore fruit, when after a super break by Ross Aitken from midfield, the ball was recycled twice and well timed passes from Ross and Fraser created the space for centre Duncan McIntyre to cross. Fraser added the conversion. However Hamilton bounced back immediately with a try for Andy Wilson on his return from injury. Slick hands and poor tackling left space on the outside for Wilson to dive into the corner, too wide for the conversion attempt. Dundee’s heavy pack began to impose themselves and Hamilton were pushed back into defence. The concession of two kickable penalties kept the scoreboard ticking for Dundee. The rest of the first half was an arm wrestle for supremacy with both defences standing firm until Hugo Crush found himself facing two heavy props and darted between them for a clear run at the line. This was the first of his 3 tries, and was converted by Mcleish for a half time score of 13 – 12. The second half belonged to Hamilton who scored three quick tries to push into a deserved lead. It was Crush again, diving over from the base of a ruck after some great forward play. Again McLeish converted. Crush landed his third, but owed it the work of Robert Brown who was earning his 100th cap for the club. Brown showed a real turn of speed and strength as he burst through the Dundee defence. Having made a break of 40 metres he was hauled down inches from the line and Crush was on hand to throw himself over the line for the Bonus point try. Again McLeish added the extras for a 26 - 13 lead. Andy Wilson got on the score sheet again after Captain Mark Wallace found a gap in the defence and fed Wilson to scamper in under the posts. Again McLeish added the extras. At 33 – 13 and into the last quarter, Hamilton sat back a little and Dundee showed their mettle with a great try from flanker Gus Farquhar who was on hand to capitalise on some accurate forward phases setting him free to dot down under the posts for an easy conversion. They added to the pressure on Hamilton with another score minutes later, a carbon copy of the previous one, but scored by Aitken. The Dundee support began to hope that a late surge could rescue the game, Hamilton slowed the game down, took the sting out of the attack and then released Josh White for one of his trademark bullocking runs to seal the game with the final converted try of the match. Centurion Robert Brown praised the resilience and team spirit of the Hamilton lads at the end of a pulsating 80 minutes of league 1 rugby.